Contact us for an Equipose Clinic. Visit Theresa or Priscilla's for our contact link. Download our new Free Book! It shares the eight parts of yoga, the seven centers of the body called the chakras and forty two yoga postures to help you discover your authentic divine self. Yoga and your horse is a gratifying experience. An Equipose session can be practiced with your equine partner or on a simulated horse. The program is designed to empower you with a way to implement Equipose. 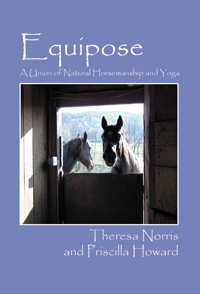 Equipose is a comprehensive guide that discusses the energy centers of the human and horse, holistic equine care, desensitizing through approach and retreat, ground work techniques, equine stretching and natural riding methods. Discover how Equipose can bring balance to the mind, body and spirit. by Theresa Norris and Priscilla Howard. To learn more about Theresa and Priscilla, or if you have questions, select their individual page. Contact us for an Equipose Clinic at your farm, home or business. Equipose with your Equine Partner 30-60 mins.of equipose stretches mounted on your horse. A stress free way to spend time with your horse. Your horse will love the undemanding attention while you connect deeper with yourself. The ultimate equine experience! Materials needed tact of your choice, halter and lead line, helmet, boots and of course your horse. Select the yoga styles that meet your needs. Groups of 6 or more receive a 20% discount for the session. Prices are based on the program selections, your location, and number of participants. Reserve your Equipose Clinic today! Content copyright . NATURALEQUINELIVING.COM. All rights reserved.